Shari's family asked me to speak at her memorial service last May (2013). Here's what I said. From the first day I met Shari, I was blown away by her incredible honesty and her fearlessness. She embraced the challenges and promises of the 60s. Together – along with some of our classmates at Beverly High - we listened to the Beatles and reveled in the musical revolution of the time; delighted in discovering the newest movies by foreign coming filmmakers; talked about the boys we had crushes on; broke the dress code and demanded that black kids be bused to our high school; protested the War in Vietnam; and decided that we wanted to be part of the solution, not part of the problem. And that was only a small portion of Shari’s first act. 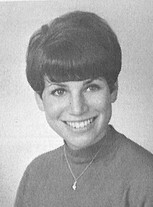 I’ve been in touch with many of our high school classmates in the last several weeks, and they’ve shared their remembrances of Shari’s generosity of spirit, openness, keen intelligence and wit and her wisdom in all things, large and small. There was no way you couldn’t love Shari or be drawn to her. From Fred Mann - She was always someone quite special to me. I always loved her enthusiasm and her openness and her sincerity. OK…and that smile. From Paul Rosenstiel - I particularly remember picnics at Coldwater Park with Shari and Denise Leader, eating French bread and cheese in an attempt to be sophisticated. From Larry Koplin - The Bald Eagles are all very sad. From Michael Tolkin - I was thinking of Shari only last week when a mutual friend posted a yearbook picture of the Thespians and I hurt my brain trying to remember everyone's names. Maybe ten still hold, Shari being front and center- her character is there in that picture, clear, forthright and honest and confident. I think she was the first person I knew from high school who became an adult. From Laurie Zoloth – Shari, you were the great sweet joyful light of our class--the warmest, funniest and most joyful friend. Thank you for your abundant and steady generosity, your staunch friendship and your smiles. Those smiles warm me still. I will never forget your wonderful joy. Thank you. You are a blessing. You are the best of us, the one we all loved. For me…though our twenties took us in different directions, I had the great good fortune to reconnect with Shari right around the time we both had children. I was amazed at how deftly she managed to juggle the sometimes conflicting demands of marriage, parenthood, and career – something that is extremely difficult to do well, if at all. I will miss our resale shopping expeditions where Shari could spot vintage Pucci, gorgeous jewelry and perfect purses from a mile away. And I’ll miss our lunches where we talked about raising boys, politics and culture and Shari’s latest interior design projects. I am so glad that, despite her initial daunting diagnosis and the grueling therapy that ensued, she had four more years with her beloved Norman, and that she got to see Max and Sam settle down with fabulous women and that she had time with her enchanting grandchild, Mia who she adored beyond words. Her incredible grace in facing adversity was and remains an inspiration. Shari told me that her life was blessed – just too short. But somewhere – and I am not religious – I believe that her energy/spirit lives in a realm we do not recognize in a form that we do not fathom. She was too bright of a shining star to be extinguished. She will live in my heart forever. What a lovely speech. I remember Shari as a sweet, smiling person. Shari & I were very good friends in school. We chased the English groups together, listened to music and had a lot of fun. We took pictures and laughed and laughed. She was a bright light. I only learned yesterday of her passing and have been thinking of nothing else since. I was pretty convinced by my experience at Hawthorne that nobody would sincerely want to be my friend, and Shari was one of the fantastic people who showed me otherwise. Of course, we all flew off our separate ways after graduation, but I was so happy to see her at the time of the 40th reunion, and then lunch afterwards. I never met her husband or sons but I'm sure they are as bright and funny and smart as she was. I'm so sorry she didn't get more time. She really knew how to use it.